This post originally appeared on Katherine McDonald’s personal blog. Katherine is a lecturer in Classics and Ancient History at the University of Exeter. One of my academic specialisms is the study of inscriptions, otherwise known as epigraphy. Most of the material I work with is epigraphic, and sometimes this is one of the biggest challenges in my work. Learning how to read inscriptions is a skill that you need to learn by trial-and-error and, ideally, by having someone with more experience than you show you the ropes. So how do you teach epigraphy to graduate students? With a field trip to Exeter Cathedral, of course. There are a few practical skills associated with epigraphy, the most important of which is squeeze making. Squeezes are paper impressions of inscriptions, formed by hitting wet filter paper into an inscription with a specially made brush. Once the paper is dry, it holds the impression of the stone permanently. Squeezes can be rolled up and stored for centuries (for example, in Oxford) – and even posted to scholars on the other side of the world. They allow scholars anywhere in the world to study inscriptions which they could not see in person. And, strangely enough, the negative image they provide is often much easier to read than the original inscription, revealing details that were not visible to the naked eye. They can also be easily scanned and digitised. With the help of cathedral staff, we chose an appropriate stone for making a squeeze. Here’s Dr Charlotte Tupman (Digital Humanities, University of Exeter) demonstrating to some of the group. The filter paper is dampened with de-ionised water. The reverse of one of our finished squeezes – you can see a huge amount of detail of the surface of the stone (and also a bit of dirt from the floor). When I popped back the following morning, I found perfectly dried squeezes all ready to be taken up to the department. It was a really fun and practical (if slightly messy) session, and we ended up with a great squeeze of this slab. If you want to see squeezing in action, here is a page with two videos from a group of students in Athens showing how the process works. It’s not always possible to make a squeeze, though. Some stone is too soft, or too damaged, to be hit with a squeeze brush without damaging it further. Many of the inscriptions from pre-Roman Italy, for example, are on tufa – a light, bubbly, porous stone which would be more or less impossible to squeeze. In these situations, knowing how to use light and photography can be really helpful. In Exeter Cathedral, some of the most damaged slabs would be too fragile to squeeze, so we experimented with reading them in different ways. Using a torch can illuminate all sorts of details on difficult-to-read inscriptions. Many museums and churches are dimly lit, so any kind of light is helpful – but a steeply raking light, at a very sharp angle to the surface, is the most helpful. Here’s an example taken by one of the students last week. With just the natural light available, this inscription is partly readable, but not very clear. There are distinctly worn sections where the lettering is difficult to read. If we introduce a light at a steeply raked angle, we see something very different. With the light at this angle, the name “Katherine Berry” is suddenly revealed! You might be able to see the other lines more clearly as well – but of course the best thing is to take a number of photographs or readings with the light at different angles, to illuminate different letters on the stone. In the picture above, you might be able to make out that Katherine Berry “dyed” in 1687. To us, this seems like an “incorrect” spelling for the word died. But in 1687, English spelling wasn’t standardised in the way it is now, and this spelling was completely valid. So as readers we have to be sensitive to the practices of the time, otherwise our false expectations could affect our reading and lead us to assume, for example, that this couldn’t be a letter Y at all. This is equally true of Greek and Latin inscriptions. The spellings – and even the shapes of the letters – are not what we are used to. The alphabet used in fifth-century Athens, for example, is not the same as the Ionic Greek alphabet that we use to read their texts – and this can make a big difference. Similarly, in the time of Augustus, as well as later and earlier, there are inscriptions with the spelling pleps as well as plebs – both are fine, and it’s our own later standards that make one look wrong. To read inscriptions accurately, we need to allow for spellings and letter-shapes to vary. Squeeze of IG I(3) I, Late C6th-early C5th. Notice how the lambda and sigma of “Salamin” (the end of the second line) are a different shape to how we would print the Greek alphabet now. The pleps spelling in action in a (probably) Augustan inscription. CIL 06 40310. If you’ve only even looked at inscriptions as they are written in textbooks, or printed in an edition, they seem quite fixed and objective. But as soon as you start trying to read inscriptions which are worn, damaged or contain mistakes made by the original engraver, you realise how many judgement calls have to be made by the epigraphist. With experience and practice, you can get better at spotting traces of letters and making educated guesses, but sometimes they really are guesses. This is why, if you are interested in using inscriptions in your research, it is so important to see them in person (or as a squeeze) to decide whether you agree with past interpretations. Many thanks to Exeter Cathedral and Charlotte Tupman for all their help with this session. This blog post is written by Courtney Harmstone, a recent graduate of the MA International Film Business. Since graduating, Courtney has worked in freelance production on a variety of projects in London and across the U.K. Courtney is currently assisting the University of Exeter as a Marketing Assistant and working on the development of two feature films. Berlinale Talents: What is it? There are many exciting aspects of Berlinale International Film Festival, but one of the best for filmmakers at the start of their career is the Berlinale Talents. 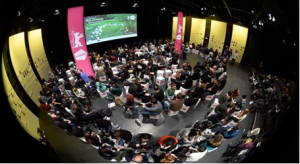 Berlinale Talents is aimed at film and television professionals who are in the first 10 years of their career. Berlinale Talents was established in 2003 as a creative summit and networking platform for promising emerging filmmakers from around the world. In 2016, there were 250 professionals participating in the event. It includes a summit programme with master classes, interactive panel discussions, studios and workshops. During six days, the participants get in touch with fresh ideas and myriads of likeminded people. It is not a “school”, but rather a community of mentors and experts who consider the participants colleagues. The Berlinale Talents is an excellent way to get involved with the festival. If you are interested in participating, you must apply in the summer (please see Berlinale Talents newsletter for the exact deadline). 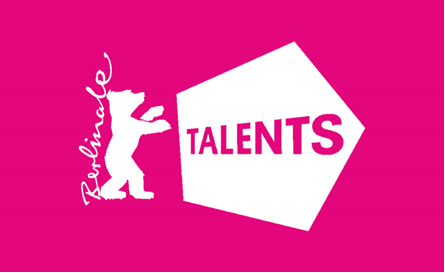 This means, if you are interested in being involved with Berlinale Talents, you will need to apply before you have started your Masters at Exeter in September. However, it is not a requirement and will not prevent you from starting your Masters or attending the field trip to Berlinale. Berlinale Talents is a superb tool for filmmakers and can aid future filmmakers in their career through networking and panel discussions. It is useful for the masters as it will give you access to another aspect of the film festival and connect you with industry members who may be helpful in your future careers. If you are interested in the Berlinale Talents, we advise you sign up for the newsletter (link below) which will send you updates for the application deadline. Participants are required to be in their first ten years of their career. Students can be accepted, on exceptional cases, when they have already worked in the film business and come with a promising record of films or series on their CV. Finding a place to stay is already a challenge, and it is made even harder when you need to find accommodation that allows you to rent for three months. Exeter, despite being a university town, does not have many options to rent for a short period of time. However, there are a few places that are open to short term leases and have housed students from the MA International Film Business in the past! After speaking to a few recent students, and alumni, I have been able to compile a short list of the organisations that offer short term leases in Exeter. When I was a student in Exeter, I rented a room in the INTO buildings. The INTO accommodation is convenient, clean, has an en suite bathroom and small kitchenette. Multiple alumni and current students have rented rooms in INTO. King Edwards Studios is another great option, with large rooms, a convenient location and short term leases. The apartment comes with an en suite bathroom, a double bed and plenty of storage space. The Kingfisher is a newer build in Exeter, independently run (meaning it is not affiliated with the university). They offer short term leases (September to January and come with an en suite bathroom and small kitchenette. A couple of students from the past two years also found a place to stay through the website Exeter Student Pad. This website allows for you to search for accommodation in Exeter, with multiple categories. Although this is a more challenging option as it requires more time and more research, many of our students found superb apartments and room shares for their time in Exeter. If you decide to take this route, I recommend skype calling with the landlord before committing – that way, you can see the space and make sure it’s right for you! Airbnb is often seen as a short term option, many of our students were successful in finding their apartments or rooms in Exeter via Airbnb. One current student even said he received a discount for renting an Airbnb for the entire time he stayed in Exeter. You never know – it is worth a shot! Nevertheless, this may end up being a more expensive option, and it is recommended, if you have a smaller budget, to look at the other options listed.